What makes women swoon? What is the quality that captures our heart, sometimes only for an instant, but sometimes irrevocably? Perhaps it is something different for each one of us. I know that it is different for me today, than it was when I was in my 20’s. I attended a party at the Delta Sigma Phi house my Junior year of college at the insistence of my roommate, Cynthia. I loathe parties in general, but I succumbed to her pleading, and when I could stand the noise and confusion no longer, I slipped into what could have been loosely called a library and began reading behind the closed door. When a handsome man came into the room an hour later, practically hitting me with the door he pushed open, I looked into the brown eyes of the man I knew I would marry. Could I have determined the qualities he possessed, untangling one from the other? No. I couldn’t do it today. But, I knew that he struck my heart and that was that. Betsy Prioleau has taken it upon herself to untangle what it is that makes us swoon and listed more qualities of what women look for in men than I could include in this post. Combined with these qualities, are descriptions of men which fit them such as the charisma of Bill Clinton, the adornment of Sir Walter Raleigh, the manly jaw of Johnny Depp, etc. Intensity/Passion can be found in Wuthering Heights, Balzac’s The Memoirs of Two Brides and Colette’s The Other One. Self Realization can be found in Alice Munro’s story Passion, or the infamously popular Fifty Shades of Grey. 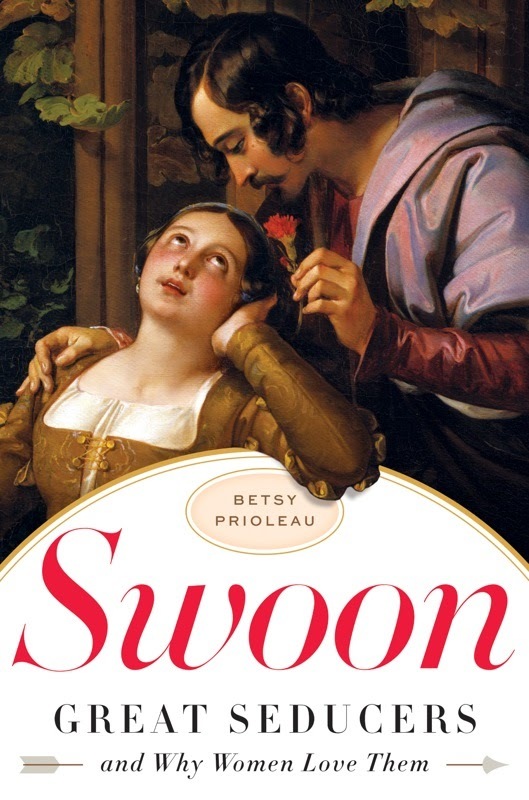 Thanks to TLC Book Tours for the opportunity to review Swoon. I'll have to reread Brave New World. I can't remember a seducer in it! I totally agree with Wuthering Heights as a book choice for this. Did you marry him??? I love stories like that — and I liked this book, too — quite fun. I did, Audra. It's so weird that I knew it, and I can't explain how. That doesn't happen very often in my life that I know something with such certainty before it happens. I loved this book; not only for how she found such interesting qualities (who wouldn't like to find someone with all of them?) but found characters in literature to coincide. I've never read Brave Nrw World. So many classics await my attention. Doesn't Heathcliffe fit the passion quality perfectly? The book sounds interesting, but I'm not sure I'd read it. As for your story about how you knew he was THE ONE – I loved it! Very swoon-worthy story 😉 Thanks for sharing it! Isn't it funny what brings people together? I guess the lucky part is the we find each other at all! It is a romantic story with an unhappy ending; sadly, my firs husband died when our son was six. But, I still like thinking of the happy memories. I'm not usually. Big fan of nonfiction, Nadia, as you probably know. Still, the idea behind the book interested me, and I've always been fascinated by what people think…what makes them “tick” so to speak. Any glimpse into our complicated ways is helpful to me. I'm very excited to read this book, though I know it will add a ton of new titles to my TBR list! I'll look out for this one; I think I'd enjoy it.